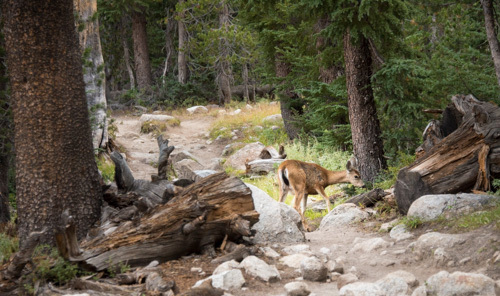 Deer are often spotted on the trail and are sometimes, literally, ON the trail! 10. An American Dipper. I saw this little guy near Helen Lake and had no idea what I was looking at until it started diving into the brook that ran near my campsite and completely submerging! To see such behavior from a bird that does not look “aquatic” at all was unusual. 8. Three deer at my breakfast spot one morning. You will see deer more days than not on your thru-hike, and they rarely are disturbed by your presence. What made this encounter so memorable was how close they were and the obvious curiosity. It made for one of my favorite wildlife photos I’ve taken. 7. A friendly pika. This little critter lived next to Lake Virginia. 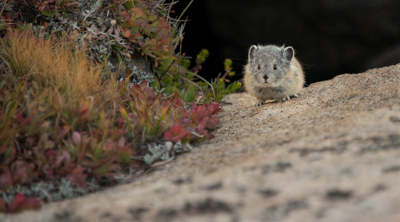 You will hear the pikas far more often than you see one, so an opportunity like this doesn’t come often. 6. A large raptor up close. This came on a hike with my wife, somewhere between Red’s Meadow and Lake Edison. We were in a fairly heavy forest where the trees were close enough together to give us limited visibility, so when it came directly at us–with a wingspan of at least four feet–it made quite the impression. When it spotted us it immediately made a hard left bank, which displayed it’s size and gorgeous feathers. I’m not sure because it all happened so quick, but I think it was a red-tailed hawk. 5. The dog at Muir Trail Ranch who fetches pine cones. Okay, so this isn’t exactly wildlife, but when was the last time you played fetch with a pine cone? 4. Sneaking up behind a coyote. Wildlife encounters happen frequently, but it’s rare that you see them before they see you! This was a fun meeting simply because I spent several minutes sneaking up behind a predator. When he finally saw me he was not happy! 3. The Great Squirrel Incident. A story of courage (not really) in the wilderness. 2. Lots of friendly marmots. If the JMT has an official mascot, this must be it. It’s unbelievable how close they are willing to come to satisfy their curiosity. They are colorful, friendly, and are ubiquitous over 10,000 feet elevation. 1. Three bears. This occurred on the first day of my first thru-hike of the JMT. What a way to start! Although we all carry bear canisters to secure our food, bear sightings are actually much less frequent than you might expect. (Bears are much more frequently seen in Yosemite Valley. 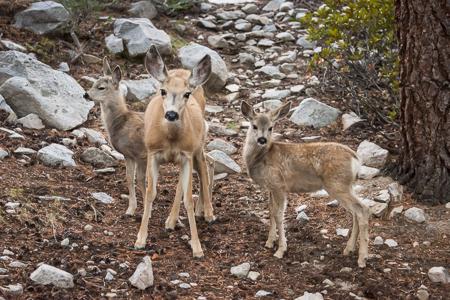 I’ve seen them around many trailheads, and have even seen a couple from the dining room at the Ahwahnee!) My only other encounter near the John Muir Trail came a few days later, not far from Garnet Lake, when a bear played with my nearly empty canister for several minutes. I listened until my ursine guest finally gave up and then I rolled over and went back to sleep. Seeing a bear is a treat; if you get the opportunity, enjoy it!